My first tea classes with Teaparker started 10 years ago, in the winter of 2002/03. 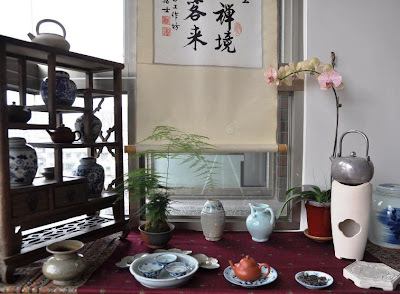 For the birth of my first son in 2003, I purchased 2 tongs of my spring 2003 wild Yiwu puerh (1 for him and one for me). A few years later, when I started to select teas for my readers, this tea naturally became part of my selection (and still is). With the blink of an eye, this tea has now reached 10 years of age. The time that has passed hasn't been lost in vain. On the contrary, and this alone would be reason for celebration, I can feel with every cup I make the positive changes that have happened to my tea life during these 10 years. That's why I chose to brew this raw puerh today. 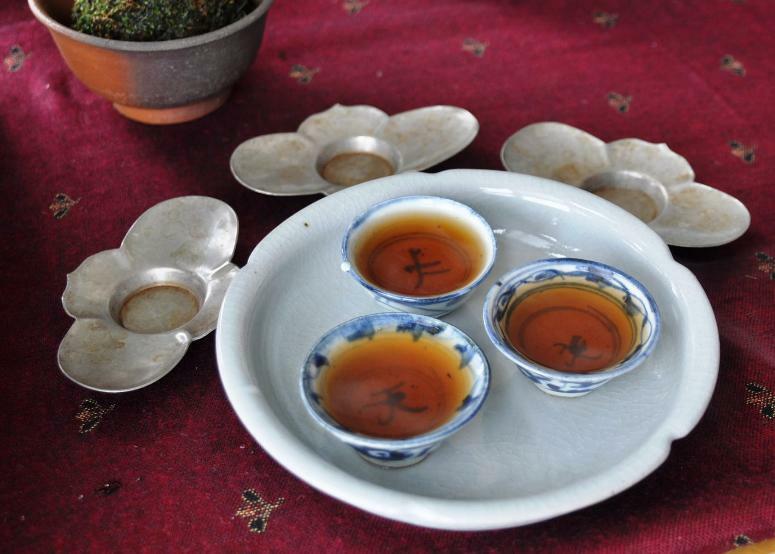 I want to taste this decade of improvement and refinement and express it with a meaningful Chaxi. 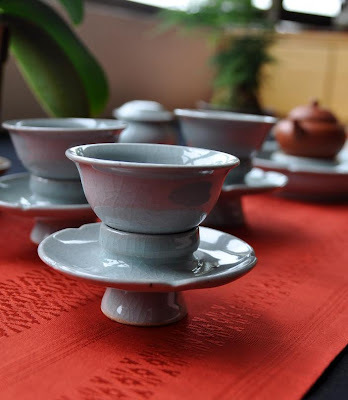 The cups I choose have recently arrived from David Louveau de la Guigneraye. 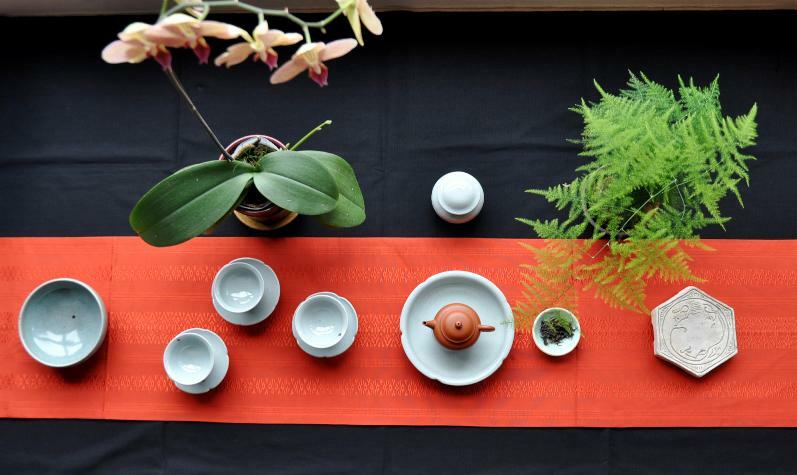 They are the 3rd version of the celadon lotus set we have designed together. (Do you remember the second version and first version?) This time the colour is more blue-green and the walls are quite thick. The glazing is very smooth and soft thanks to the mixing of some marble in his clay. David was able to push the firing up to 1320 degrees Celcius. The cups are very stable on their stand and more harmonious than the previous versions. 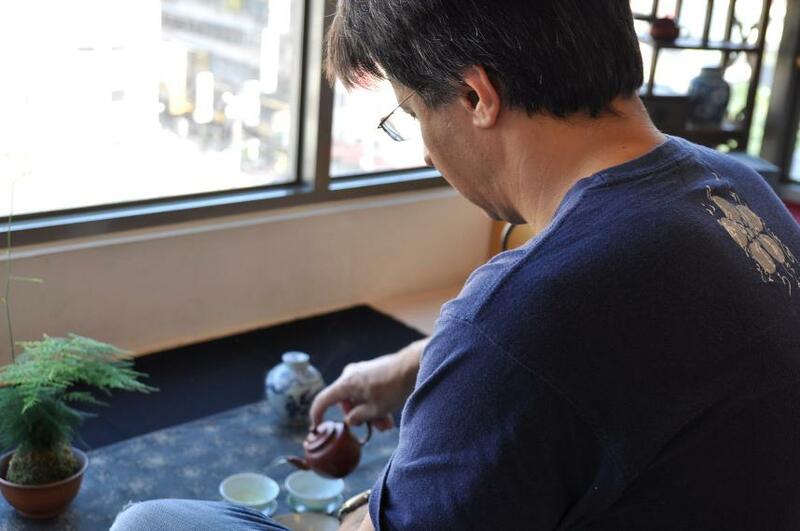 Using David Louveau's new teaware (see also the teaboat and jar below) is a way to express this decade of improvement. What is especially gratifying is to see that my tea education hasn't been a one way street, but that I could also pass my knowledge to other people (thanks to this blog) and see them improve. 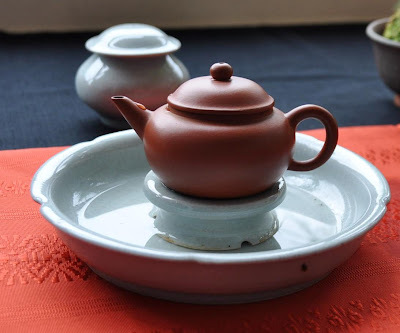 The zhuni teapot is very similar in shape to my first teapot (purchased before I started taking tea classes), but works so much better thanks to its top quality clay! There are some improvements that are not easily seen. They can be almost hidden, like the patterns on this old orange Japanese kimono belt. But these hidden improvements are often the most meaningful. 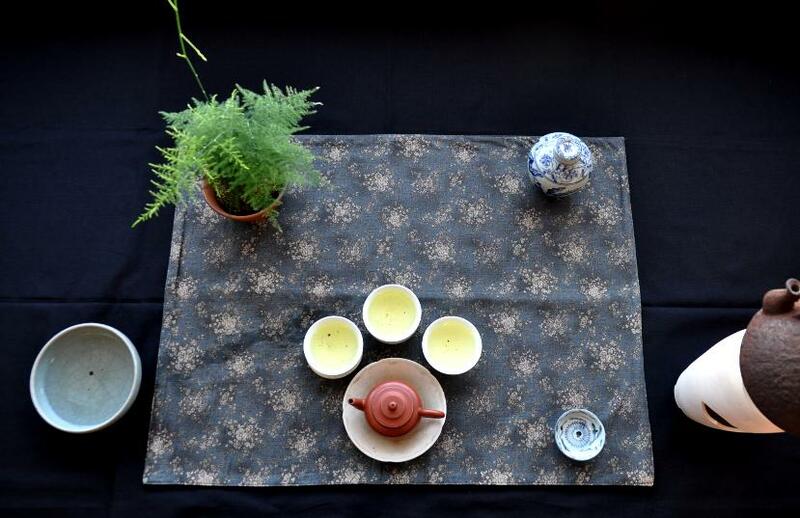 First a fine beverage, tea has become a kind of way to express my feelings in a creative and positive way. 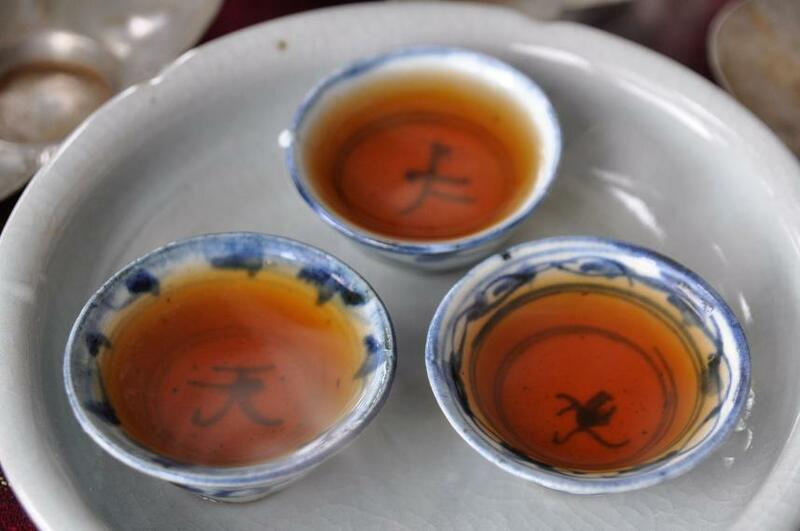 This Cha Xi is a celabration of (tea) life and the meaningful use of the last 10 years! Santé! Happy Chinese New Year! 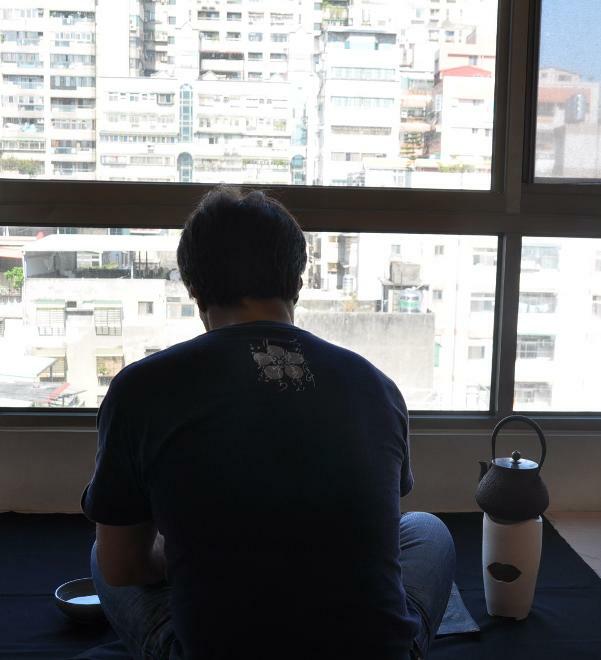 Le Nouvel An Chinois à Taiwan est l'occasion de se retrouver en famille pour bien manger et bien boire. Cela dure une semaine et mieux vaut avoir l'estomac bien préparé! 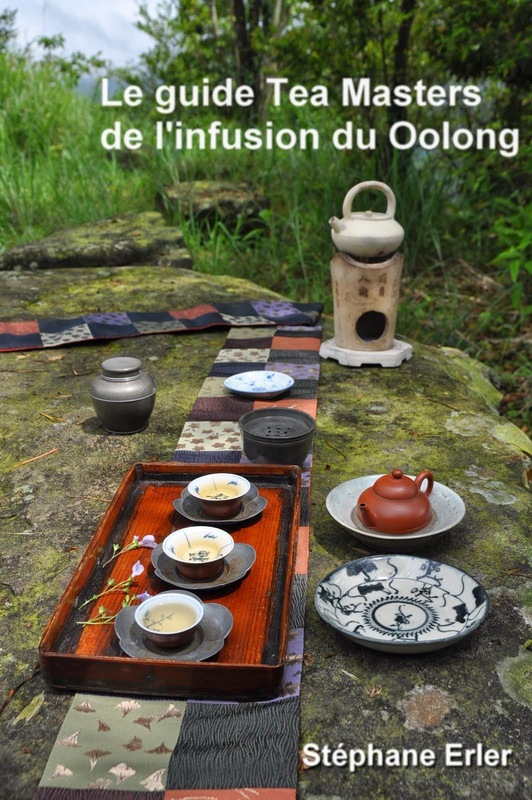 Entre les repas, mes Oolongs m'ont accompagné et aidé mes proches à digérer! Ouf. De retour chez moi, j'en profite pour célébrer le Nouvel An du Serpent avec ce puerh cru de vieux arbres d'Yiwu de 1990. 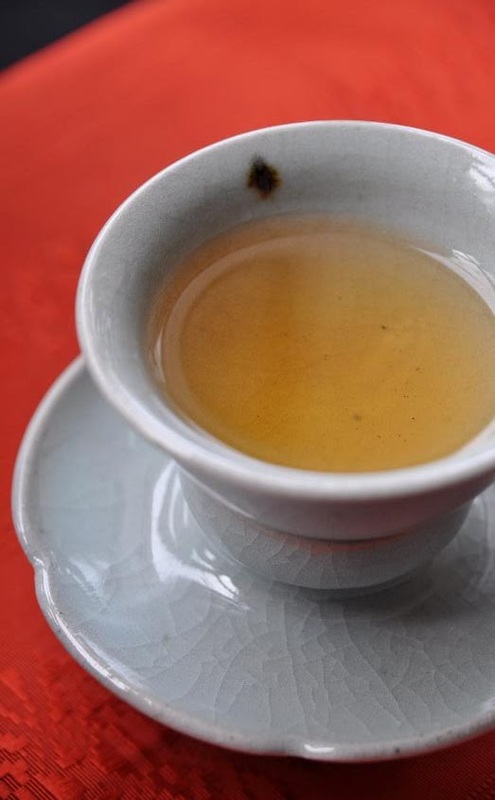 Aux grandes occasions, les grands crus ; pour les amoureux de thé, il en est de même. 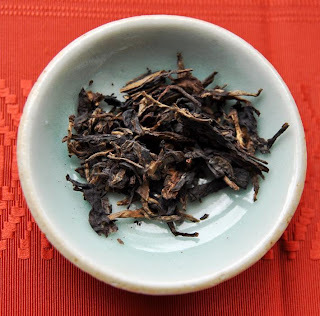 De plus, le vieux puerh cru est parfait pour revigorer l'organisme après de longues fêtes hivernales! Le charbon crépite dans le Nilu. J'opte pour la bouilloire en argent car elle chauffe plus rapidement que la tetsubin, et car je veux faire ressortir la pureté et la fraicheur de mes feuilles de puerh. Le jeune se marie avec l'ancien. 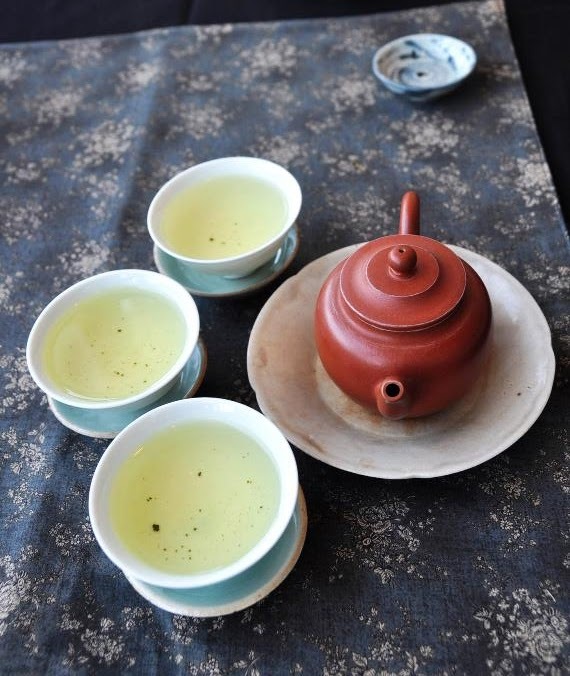 Les vieilles coupes qinghua sont sur une assiette creuse bleue/verte neuve de David Louveau. La théière zhuni sur une assiette qinghua évoque le crontraste inverse. L'infusion est limpide et prometteuse. 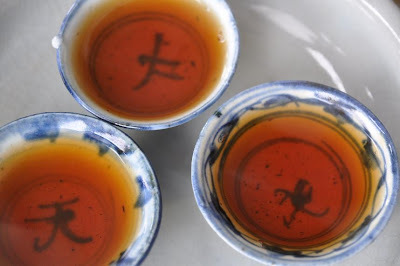 Le thé apparait léger et pur au départ, mais bientôt on remarque la force de son cha qi. Il est encore bien vif pour un thé de 23 ans. Telle est la spécificité des bons vieux puerhs. Ils sont presque éternels. L'odeur m'est très familière. C'est celle de l'atelier de potier de David Louveau à la Borne. Je m'y croirais presque! Elle combine l'odeur des riches glaises cherchées dans la forêt et celle du feu de bois des cuissons passées. 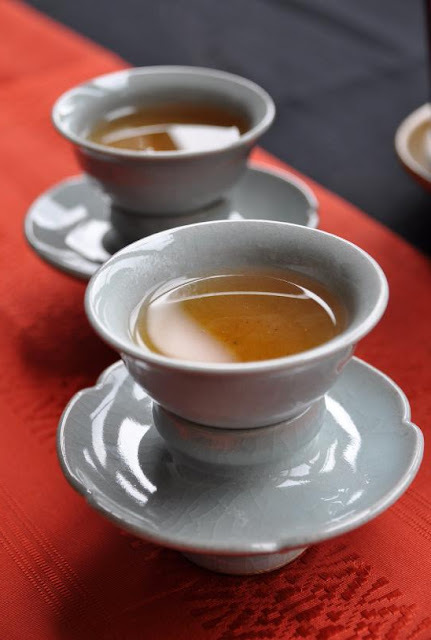 Etonnant comment un thé des montagnes du Yunnan me rappelle un atelier en France. 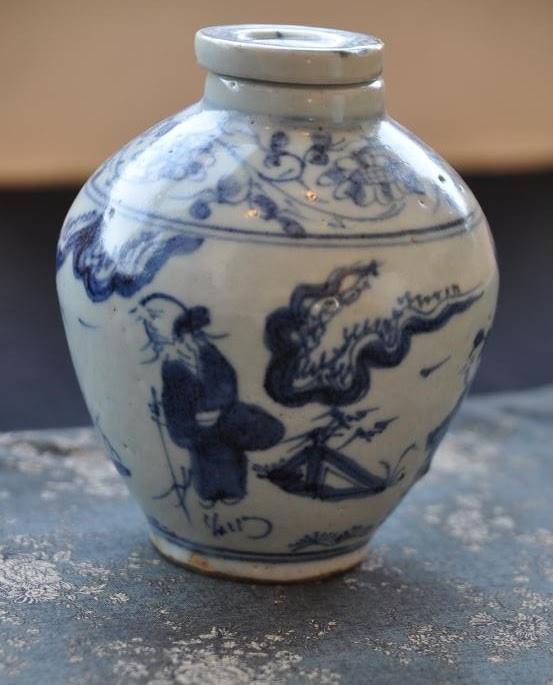 En même temps, ce n'est pas un atelier comme les autres, car David Louveau utilise des méthodes traditionnelles héritées de la céramique asiatique. Et c'est un endroit que j'associe dans ma mémoire à d'excellents moments de découverte. Quelle joie de m'y trouver transporter en esprit par ces infusions! Le Nouvel An est aussi l'occasion de faire de nouveaux achats et de mettre la couleur rouge, festive, à l'honneur. Avec cette théière Lixin (= forme de poire) en zhuni des année 1980, je fais d'une pierre deux coups! Sa petite taille permet d'être économe avec ce genre de thé précieux tout en obtenant des infusions bien concentrées. 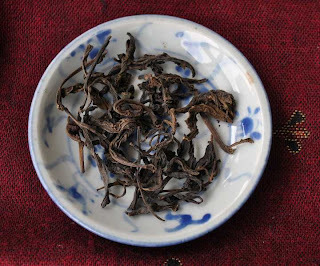 La surface de la glaise zhuni n'est jamais vraiment lisse. Elle peut être fine (comme ici) ou plus épaisse, mais elle est toujours très dure. Elle n'absorbe pas les arômes, mais les restitue avec plus d'intensité que la porcelaine. Harmonie de l'infusion avec sa coupe. Harmonie entre feuilles de thé et théière. Harmonie dans le corps et l'esprit. Teaparker's latest book has been published! This one deals with the relationship between silver ware and tea! The history of this relationship dates back to the Tang and Sung dynasties. 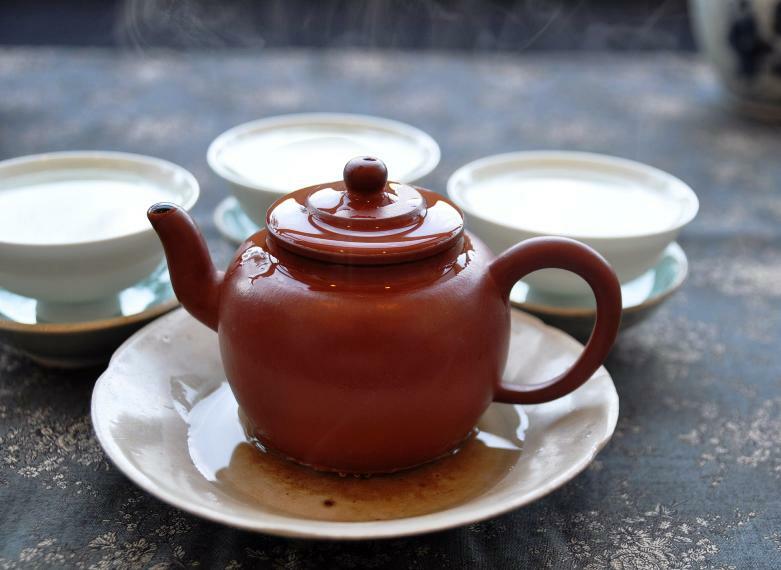 Later, silver also became an important tea accessory in the West. This book gives life to this forgotten history with wonderful pictures. 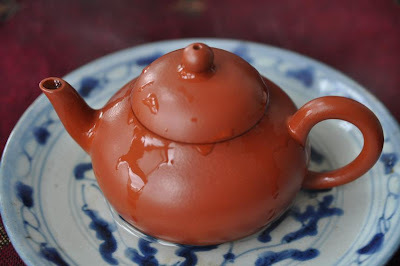 Water boiled in a silver kettle is different than boiled in a tetsubin. Last week, in tea class, I experienced that High Mountain Hung Shui Oolong tastes better (clean and pure) with water from a silver kettle. The water from the tetsubin was adding too much complexity. 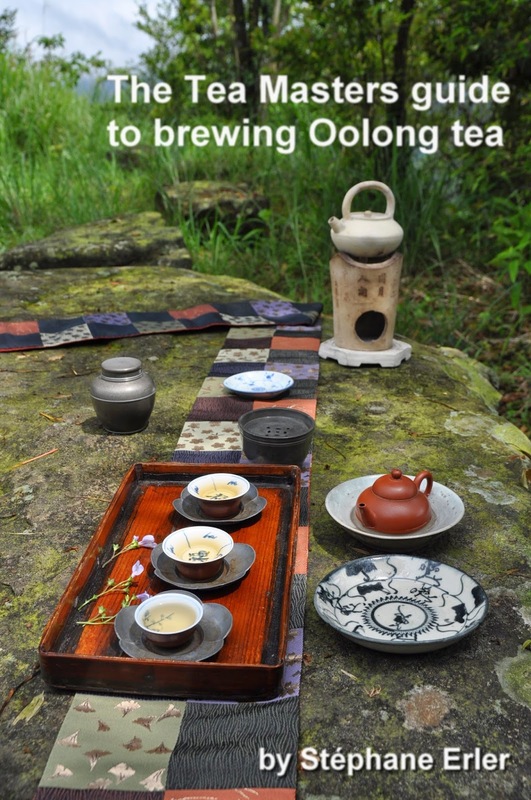 Silver opens new ways to experience tea. 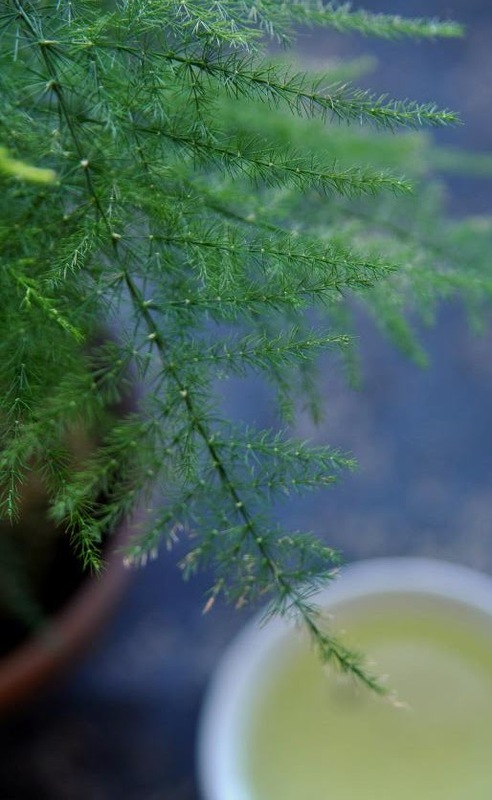 It brings out the wonderful fragrances of the leaves. What a wonderful day outside! What am I still doing inside my apartment? Let's have a look over my shoulder. 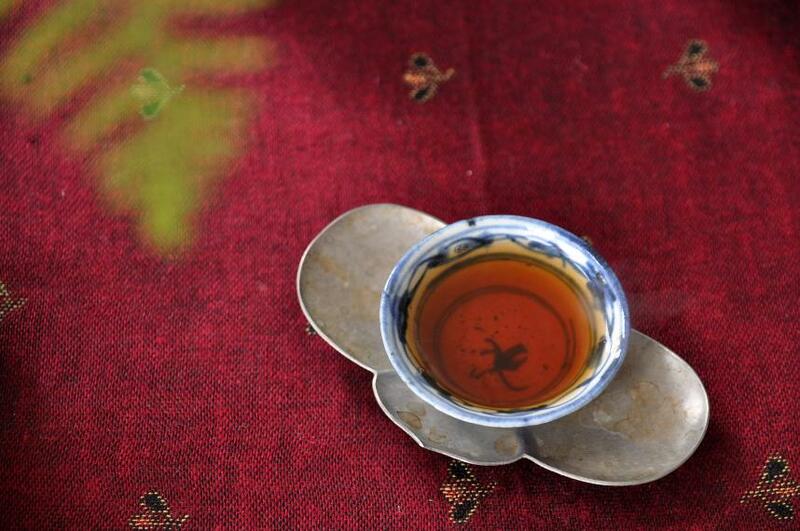 You've guessed it: Tea and a beautiful Cha Xi! 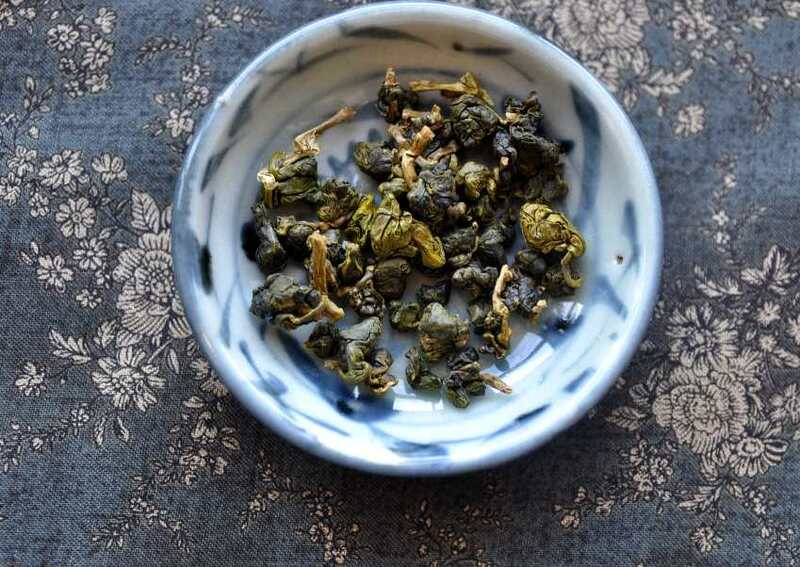 Here are the leaves that will quench my thirst for freshness and spring-like energy: Ali Shan qingxin Oolong from April 5, 2012. The latest comment on that article reminded me how good this tea is. I don't drink unroasted high mountain oolong so often in winter... Right now, my leaves are stored in this qinghua jar below. It's half empty, now, but it was almost full when I filled it this fall. The cover is just sitting loosely on it, but I haven't noticed any storage problems. On the contrary, the tea seems to get more refined and pure as time goes by. 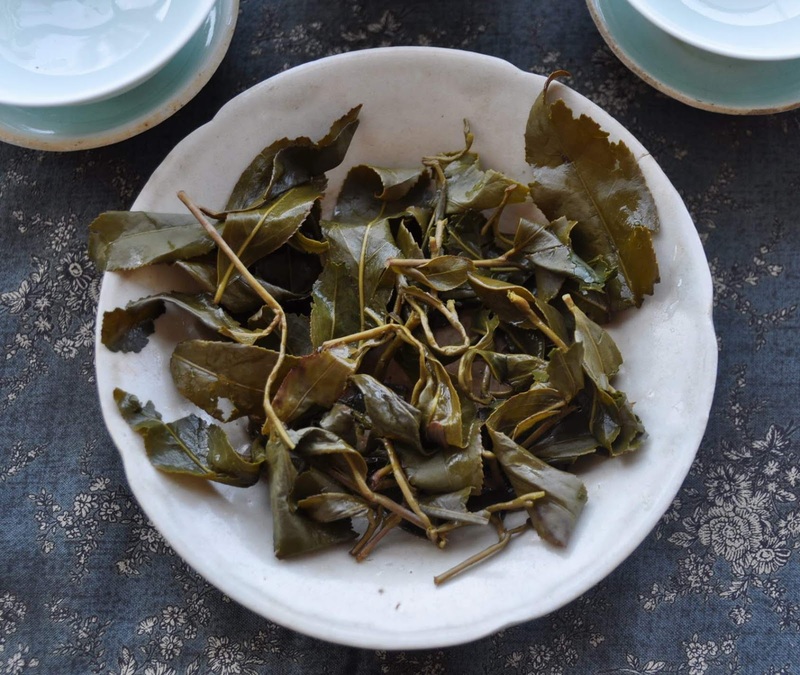 I'm using very few leaves only, as it's a tea I want to experience light. The zhuni teapot clay helps getting a lot of aromas out of it. It also adds a depth and warmth that you don't get with silver. 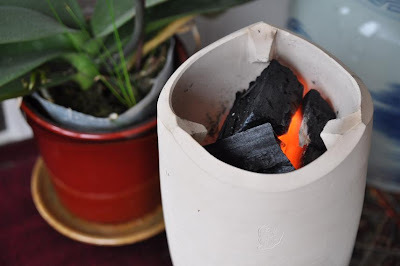 The light fragrances bring scents of spring flowers. The taste feels powerful and pure. The aftertaste is like a high frequency buzzing in the mouth. 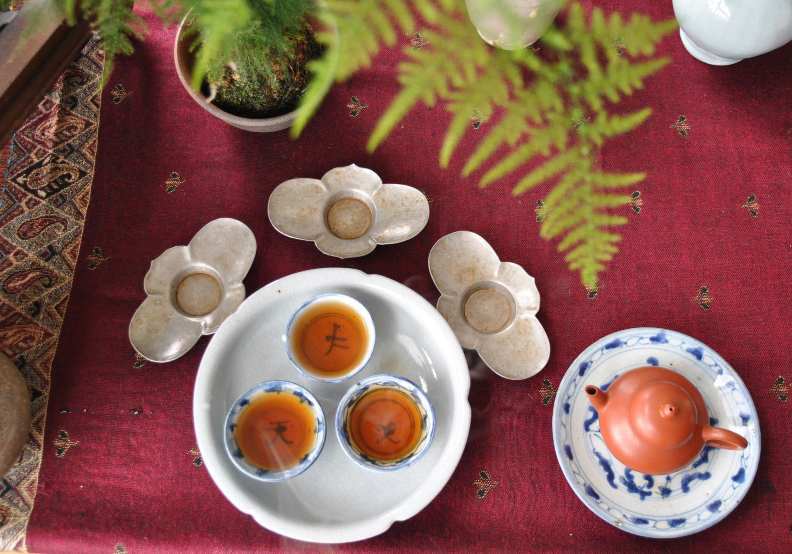 The qingbai singing cups on old qingbai plates underline the feeling of freshness, while the zhuni teapot on the beige porcelain plate remind of warm winter colors. The waste water comes from Michel François, the artist potter, who creates very well balanced and unique wares. Here, I love the warm feel of this bluish celadon. And there is this big beauty spot inside the bowl... 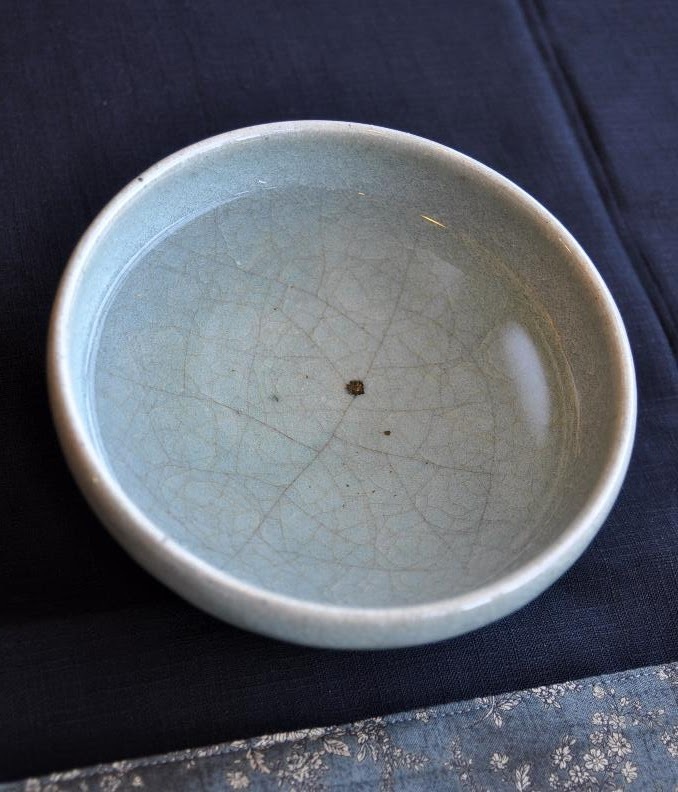 It captures our attention and lets us examine the cracklings of the glaze in detail. The spent leaves are big and healthy. Some were eaten by insects on the edges. They look thick and healthy, proof of their top quality. It really felt like spring on this last day of January!